Abstract: The Hnilec S-type granites show a primary enrichment in the elements Sn, Rb, B, F, Nb, Ta and W which are hosted in mineral assemblage of cassiterite, tourmaline, fluorite, Ta- and Nb-phase etc. Such an evolved or specialized character of primary felsic melt was caused by a higher mobility of volatiles (B, F) due to the primary increased contents, which resulted in depolymerization of melt and consequently the decrease of density and viscosity. The B content in the granite body increases toward the granite roof-zone and reaches its maximum in the marginal granitic pegmatites and in the surrounding wall rocks. The greisenized granite parts are generally low in B. Although the F content also increases towards granitic cupolas and the highest F is in the altered parts (greisens), it is very low in the exocontact wall rocks compared to boron. Principally, there are not significant differences in boron and fluorine mobility but the observed assemblage are simply related to precipitation mechanisms, which are very different for the two elements. The main B carrier is tourmaline, which was formed by primary magmatic and secondary hydrothermal precipitation. The tourmaline found in the granites is mainly schorl, rarely foitite, whereas, tourmaline with higher dravite molecule is typical of the granitic exocontact. The schorl with higher dravite molecule also occurs in the cracks and rims of the primary schorl and formed from post-magmatic volatiles, which circulated between granites and granite host rocks possibly during mixing of magmatic and meteoric waters. The main concentrators of F are white mica, which trapped fluorine by OH exchanges, and fluorite. The outline of the greisen formation in the Hnilec region has been interpreted as a process above the emanation centre in the Hnilec granite cupola at locality Medvedi potok Valley. An emanation spot was a space with high volatile flux localized above the position of hydromagma which formed beneath a fine-grained granite carapace or between fine- and coarse-grained granites in the overpressurring regime. If the vapour pressure of the dissolved fluid exceeded the lithostatic pressure it caused the rupture of the overlying crystalline rocks and the flux of volatiles have altered rocks and became the source of special mineralization of the Hnilec and Gemer granites. Abstract: Crystalline exotic pebbles have been found in the deep-water flysch of the Cisna Beds, in the Dukla Nappe, Polish part of the Outer Western Carpathians. Most of them occur in a layer, which extends over a distance of at least 3 km within the SE limb of the Chryszczata–Wolosan–Mala Rawka anticline. The dimensions of the pebbles vary between 2 and 18 cm (middle axis). The exotic pebbles consist of three types of granite derived orthogneisses: 1 — medium-grained, medium-banded orthogneiss with alkali feldspar porphyroblasts showing structural features of foliated granitic-gneiss, 2 — medium-banded, medium-layered orthogneiss containing small microcline porphyroblasts and showing structural features of foliated granitic-gneiss, and 3 — strongly cataclastic granitic-gneiss with chess-board albite porphyroblasts showing properties of partly mylonitized granite. The chemical composition of the orthogneisses indicates that the protolith was represented by peraluminous, poorly-evolved, S-type granites exhibiting features of orogen-related crustal granites. The discrimination shows that the protolith of the studied rocks evolved in active continental margin or continental collision environments. The biostratigraphical data on deep-water agglutinated Foraminifera suggest the position of the exotic-bearing layer in the lowermost part of the Rzehakina fissistomata Zone corresponding to the lowermost Paleocene. Petrographic affinities between orthogneissic pebbles and mineral/rock fragments grains of the Cisna-type sandstones show that they have the same provenance. These deposits were transported from the NE extension of the Marmarosh massif, which had the character of a continental bearing source cordillera, formed mainly by orthogneissic and granitic rocks. Abstract: Conodont faunas, which generally represent the pelagic palmatolepid-polygnathid or palmatolepid biofacies and correlate well with the standard Upper Devonian conodont zonation, were obtained from an incomplete stratigraphic section of the Ayineburnu Formation, Istanbul Zone, Turkey. Three of the upper Frasnian standard conodont zones extending from the Lower rhenana Zone into the linguiformis Zone, and six of the lower Famennian standard conodont zones extending from the Middle triangularis Zone into the Uppermost crepida Zone have been recognized with these conodont faunas. Zonal indices for the Lower triangularis Zone and the Frasnian/Famennian (F/F) boundary are not present. Strata assigned to the linguiformis Zone are overlain by a one meter unsampled interval. The next sample represents the Middle triangularis Zone, the conodont faunas of which are densely covered by matrix, suggesting a reworking. Also, the presence of the Lower and Middle crepida Zones is based on the recognition of only the lower and upper limits, respectively. The boundary between these zones could not be determined due to the absence of the zonally diagnostic taxa. Abstract: Biostratigraphic investigations of pelitic intercalations and pebbles within the Konradsheim Limestone (Gresten Unit, “Gresten Klippen Zone”) in the area of Konradsheim and Pechgraben — Maria Neustift (Lower and Upper Austria) imply that at least a part of that limestone is Cretaceous and not only Jurassic in age. In marly intercalations Foraminifera assemblages with Caudammina ovulum were found, in addition some pebbles in conglomeratic limestones contain Radiolaria of Early Cretaceous age. Therefore, the sedimentation of the Konradsheim Limestone lasted at least to the Early Cretaceous. The provenance of the Cretaceous Radiolaria bearing limestones is interesting, as north from the anticipated paleogeographical position of the Gresten Unit (European Platform) there are no similar deposits; they are only known from the Alpine realm. 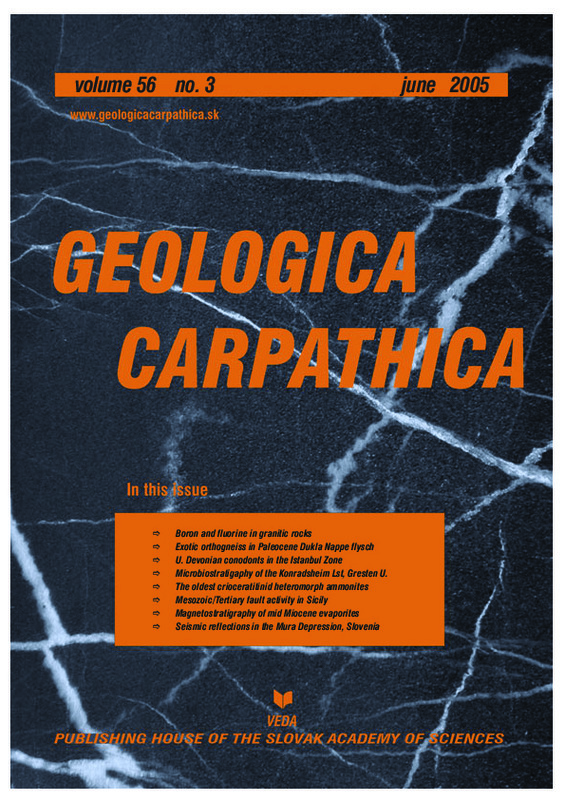 Implications for the Alpine and Carpathian geodynamic evolution are discussed. Abstract: An Upper Valanginian ammonoid collection from the Manin Unit (the Butkov Quarry of the Ladce cement works, middle Vah Valley) obtained recently contains true Crioceratitinae and other related subcriocone ammonoid shells belonging to six species of Crioceratites, Criosarasinella and Himantoceras. The occurrence of Crioceratites in the ammonite furcillata Zone represents the first known Valanginian record of this genus from the Central Western Carpathians. On the basis of the morphology of its early whorls, Criosarasinella is taxonomically assigned to the family Ancyloceratidae, the same as Crioceratites and Himantoceras. Abstract: Extensional structures of different ages characterize the Sicilian fold-and-thrust belt. Normal faults ranging in geometry from stepped to listric and formed in different geodynamic settings significantly controlled the pattern of syn-tectonic deposits. Since Mesozoic times Sicily has experienced deformation related to the opening of the Tethys Ocean. Between the Upper Triassic and the Cretaceous normal, strike- and oblique-slip faults, developed in northern Sicily, in the framework of a transtensional deformation regime induced by the oblique rifting of the African and European continental passive margins. Since Tertiary times a reversal in the general relative plate motion induced convergence, followed by collision of the European and African margins. Neogene compressional deformations were locally associated to extensional structures related to the orogenic wedge taper and to the Pliocene-Pleistocene Tyrrhenian Basin evolution. The persistent activity of extensional structures at different times and within different tectonic pictures is magnificently preserved in the following Triassic-to-Recent stratigraphic record: (i) carbonates were deposited on the Jurassic passive margin, formed by neritic platforms and intervening pelagic basins; (ii) the Cretaceous extension in the Africa plate boundary followed Late Triassic-Early Jurassic transtension due to Neotethys stretching; (iii) clastic deposition occurred during Neogene chain building ahead of the advancing thrust front (foredeep deposition) and in the inner sectors of the orogenic wedge (perched deposition in extensional setting); (iv) the perched-basin deposition at the rear of the wedge was probably related to the extensional collapse of the taper during the Late Miocene and (v) the attenuation of previously thickened lithosphere corresponds to the onset of the Tyrrhenian stretching. Abstract: The Zbudza Formation of the East Slovak Basin is a consequence of major salinity crisis in Central Paratethys (Central Europe) in the Badenian age. The magnetostratigraphic investigation results of the P-3 borehole (NW of village Zbudza, Michalovce district, East Slovakia) were used to correlate the Zbudza Formation with magnetic time-scale (Berggren et al. 1995). From the most probable variant of correlation follows that the Zbudza Formation is coeval with Chrons C5ADr p.p., C5ADn, C5ACr, C5ACn, C5ABr, C5ABn and its numerical age is = 14.7–13.3 Ma (1.4 m.yr.). This time interval corresponds to planktonic biozone Globorotalia peripheroacuta Lineage Zone, lower and middle part and to calcareous nannoplanktonic Zone NN5 upper part and NN6 lower part. Thick delta and prodelta formations (ca. 2000 m) covering the Zbudza Formation originated in a relatively short time 13.3–13.0 Ma (0.3 m.yr.) during the uppermost Badenian. Abstract: Two antiform structures in the Mura Depression were investigated as the most promising in Slovenia for the construction of an underground gas storage facility in aquifers. Seventeen reflection profiles with a total length of 157 km were recorded, and three boreholes were drilled at their locations. Structural models based on interpretation of the reflection seismic data, were constructed for the two main horizons (the pre-Tertiary basement and the Badenian/Sarmatian boundary). Evaluation of different seismic velocity data was carried out to establish lateral velocity variations in order to perform correct time-to-depth conversion. The porous rock in the Pecarovci structure is a 70 m thick layer of dolomite, occurring at a depth of 1900 m, whereas layers of marl, several hundred meters thick, represent the impermeable cap rock. Due to faults, the Dankovci structure, at a depth of 1200 m where the reservoir rocks consist of thin layers of conglomerate and sandstone, was found to be less reliable. 1D synthetic seismograms were used to correlate the geological and seismic data at the borehole locations. Raytracing modelling was applied to confirm lateral continuity of some horizons and to improve the structural interpretation at the locations of faults, which are critical factors for the storage of gas.